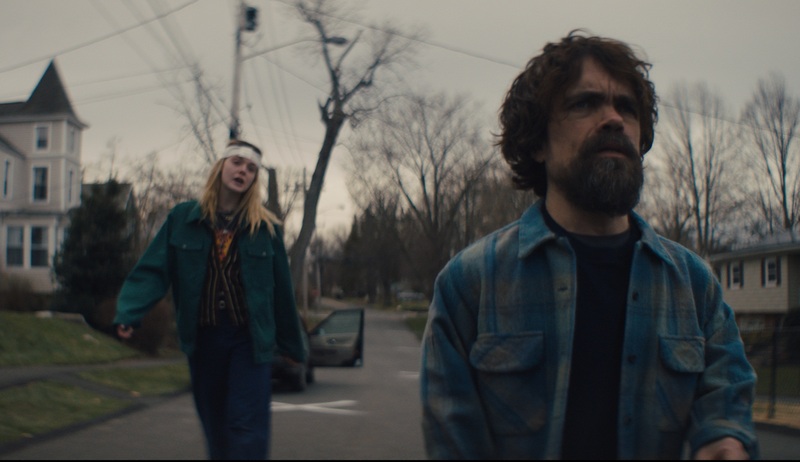 Peter Dinklage and Elle Fanning are the last people left in a post-apocalyptic small town. What do they do now? Some interesting ideas from director and cinematographer Reed Morano, as Marie found out. The opening 12 minutes of I Think We’re Alone Now is entirely dialogue free. That’s only natural, of course, as we accompany Del (Peter Dinklage) on his daily routine where he enters houses, pilfers batteries from appliances, collects photographs and buries the dead. Del seems to be the only survivor of some unexplained catastrophe which has put an end to humanity and has no one with whom to have a conversation. He has made his home in the public library where he has books to read, DVDs to watch, and a beautiful view to accompany his evening meal. He’s content in his solitary occupations until a firework display wakes him one night and he realises he’s clearly not alone. Grace (Elle Fanning) is a young woman who has also survived and is now on a road trip to see the major sights of the US – and why not? It’s the first of many differences between the two: she goes travelling, he remains in his home town; she enjoyed the company of friends before the disaster, he’s a bit of a curmudgeon who doesn’t seem to like people; she’s looking for connection, he’s content with his lot. For the first 60 minutes of the film, we’re with either just Del, or Del and Grace. There are no others. Despite Grace’s generally upbeat attitude and curiosity, conversations are minimal and the pace is steady. There is little to excite, but there are some incredibly well-observed details of what it would actually be like to be a lone survivor. And then comes the obligatory twist in the final act where the tone, colour palette and location all change, and we get some (but not all) answers. Both Dinklage and Fanning are really good, both individually and together. I’ve long said that Peter Dinklage is hugely talented and needs some varied and prominent roles to allow him to shine more – and this fits the bill. The director Reed Morano also takes on cinematography duties, and her awards for cinematography on The Handmaid’s Tale are clearly well-earned. Portraying a world without electricity requires a good command of filming in natural light, and setting the majority of the scenes in autumnal up-state New York leaves the colour palate deliberately drab, adding to the feeling of end-of-the-worldness. When colours liven up in the final act, it’s quite an assault on the senses, and deliberately so. Although the final act went somewhere it definitely didn’t need to, I’d definitely recommend I Think We’re Alone Now for the two central performances alone.